What do we really value online and can traditional publishing companies adapt quickly enough to save themselves? Earlier this week I and a group of social media ‘influencers’ were invited to a briefing by News Ltd of their, two years in the making plans to move to Australia’s first big Freemium news content model. Basic freemium model – a range of teaser online news excerpts leading to fuller, more in-depth news stories behind a pay wall at subscription prices starting at $2.95 a week to $7.95 including the daily printed paper. 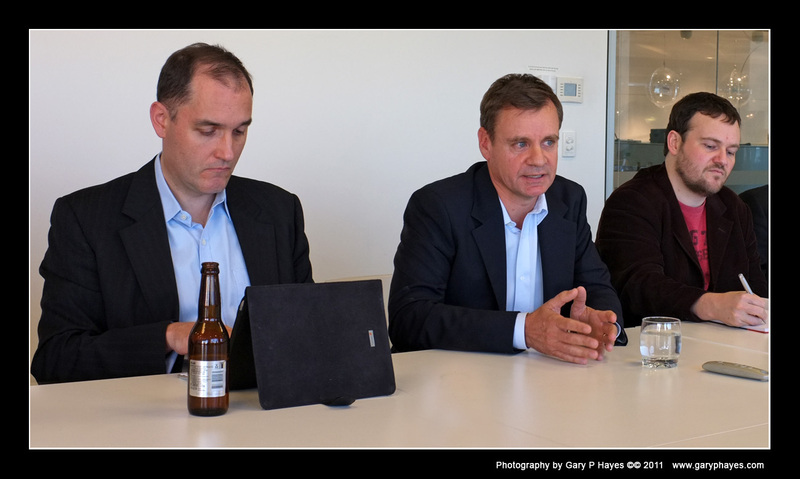 The basic details of the plan were dutifully and immediately blogged in traditional journalistic style by Ross Dawson and Tim ‘Mumbrella’ Burrowes (both featured above with Richard Freudenstein CEO of the Australian). But alternate opinions are surfacing from other online ‘influencers’ who were there – including Laurel Papworth (who just published a thoughtful Paywall for News.com and Online Community Social Media), Gavin Heaton (his tweet compilation) Tiphereth Gloria, Katie Chatfield, Craig Wilson, Bronwen Clune and Karalee Evans. Some were feeling privileged to be at this briefing (in advance of traditional media – who of course are competitors so why not invite the ‘independent voice’) but others were confused regarding the actual value proposition being put forward. Firstly hats off to the large News Ltd operation for taking this ‘if we don’t were damned’ and ‘if we do were also damned’, step. Also for setting up a no-mans land, bridging site, looking at the Future of Journalism. It is really the only thing they can really do at this juncture – so it all comes down to ‘how’ they do it. I and others pointed out during the session that regardless of the mammoth ‘back-end’ production, business and editorial systems upgrade, it really boils down to IF users like the taste of this particular flavour of digital content. Is there a demand for your ‘paid for’ product? Some heritage news orgs are starting to turn the corner of this ‘experiment’ of course while others have just crashed and burned. Yesterday AdAge reported on New York Times just keeping it’s head above the water with it’s 324 000 and climbing, digital subscribers. It announced that, as it’s print ads decline by 10.4% a quarter it’s digital ads (up 6.2%) and increasing subscribers online are balancing the books, just. Within the company’s news media division, which includes The New York Times itself as well as the Boston Globe and other newspapers, digital-ad revenue increased 6.2% — slower growth than in the second quarter — while print-ad revenue dropped 10.4% — a sharper decline than last quarter. In a world of scarcity asking people to pay for ‘information’ or stories about themselves and the wider world makes sense. Get that. But in a world where digital, to a growing number, means free access, open re-distribution, self-publishing and outright plagiarism of those same stories, will ‘paid for news’ ever work? Lets step back from the granularity of price points and production challenges covered by others for the moment and without getting bogged down in journalistic integrity or endless ‘manipulative’ stats, lets get back to basics. As we all know the world of distribution has changed forever over the last two centuries. 2000 onwards – The means of production and distribution is now given to most – a many-to-many model where ‘our stories’ and the events we experience are shared instantaneously across open shared, social networks – co-existing with legacy distribution? For those who reaped the rewards of the 20th century model it has been a shock over the last decade. Trying to be heard above the noise and retain their dominance. The decline in traditional models whether it be music, print or commercial TV ad revenue, box office sales, death of book stores is evident for all to see. Those who say things are as they always have been, the golden age of TV or print are deluding themselves. Traditional 20th Century models are failing fast. We are in transition and new online business models are still very unclear and unproven. What do consumers really value? And how pay walls, will work. Alternatively we should consider some user centric thinking. Rich news experience design, starting with not page views, time spent inside the portal, but what consumers really want. This blog was called personalizemedia for a reason back when it began in mid 2005. The true emergence of self-publishing or individuated media around that time meant that traditional media would have to evolve in response. Many of my first posts reflected this new direction and exposed a real lack of thinking from legacy media, in terms of evolving user value and need. So here are ten (not necessarily top ten) reasons users will value paid for news. I deliberately styled it in traditional ‘user research’ survey mode to be mildly antagonistic, but the ‘we want’, need centered approach is critical for anyone looking at digital business models moving forward. We are pretty lazy. We would rather pay for one stop packages, delivered in bundled channels or on one site or to one device, than scavenge around their networks for tidbits or half facts. This is true now, but beware, we are learning quickly to hunt around and create our own content dashboards – you might want to consider that when spend 3 years rebuilding your backend, for whom? Us digital natives are living in a multi device, multi channel world, we don’t want locked down packages. We want to buy a range of content which we can access on every device we have or come into contact with – even our friends gadgets. We want to sign up once, a single ID, to get it everywhere and of course share it. If the content is fascinating enough to us and we have paid for it – we will want to share it with our community of interest. Not cut and paste but send links so our friends, so they can share in the ‘rich news experience’. Stop us doing that and we will simply go to places we can and cancel our subs. Sure serendipity is nice. Surprise us with stuff we would never demand – but the days of scanning a newspaper for one or two stories that someone has decided are good for me, are long gone. Regardless of ‘your’ statistics most of my world of people don’t even pick newspapers up anymore. Commercial free to air TV and ad full mags also helped kill that off years ago. Now we live in a ‘keyword world’ and contextual or personalised news is what will and is already being expected by us. Hyper local moves to hyper personal. OK. Like a good film, well scripted, well acted, high production value the experience we get is much better than not. News stories are the same. If they inform and provide unbiased analysis, that is special, worth a penny or two. As long as it meets the above criteria first. This is not high on my list in a world of alternate viewpoints on the same story. I can bounce between five or six, free online ‘trusted’ portals and see the same story easily and make my own mind up. Beware banking on a few ‘personality’ news celebrities, they put one foot out of place and your business model crumbles as subscriptions are cancelled. This is the problem but also the saviour of traditional news organisations. That as well as trying to ‘inform’ they have, for survival, to ‘entertain’. In TV land, commercial free to air news is less about entertaining and more about ‘titilating’ – whether gruesome images of accidents or war, endless stories about local death or fraud or celeb faux pas, the constant ‘if it bleeds it leads’ drivel. Most of us on the free side of the fence lap it up. Behind a paywall though we value information, factual, clear and truthful, well researched – make us feel special. But we want it delivered with aplomb and personality. We don’t want randomly rearranged press releases or useless stats disguised in colourful info graphics. In the same way we pay for entertainment stories we want our news stories to tell us the facts but in an accessible manner. The issue with walled garden paywalls is that giving your opinion, although compelling if it is a controversial story, is made much less compelling knowing that only a small number of our friends and colleagues (who are also inside the walled garden) are actually able to see it. So sure people will value the ‘conversation’ option but if it is a very limited one, with strangers much less so. And to be honest the ones who pay (as in too busy or too lazy) are the ones least likely to take part in heated debate – leave that to time rich students or other activists! 8 Rich media – Words are cheap. We will pay if it goes beyond text and truly has rich media, not decorative library images! We are living in a broadband world and we can view video now on all our devices. Sure we like to read wonderfully written news stories, we expect that, but give us something moving. No we don’t want endless talking heads or some experts on the top of your building saying what they think ‘about’ the story, we want to see the actual story – nothing more, nothing less. We also want you to link out – yes, take us away to great reference sites, forget about locking us into your portal. We don’t trust anyone who keeps us locked in a hub site as if no one else has anything to offer! Later on, if we have time, we can delve into all those opinion videos – but they should not be 3 steps removed and should definitely not be in place of the ‘actual’ content. And don’t get hung up on over edited pieces, we expect news video to feel real. 9 Originality – If we Google it and can’t find the same ‘exclusive’ stories elsewhere we will pay! Sure news is news and when a big story breaks. But we want more than all that anecdotal stuff we can see immediately on twitter or from our friends on Facebook, we want a ‘mature’ big picture view. We also want to know that the news story is actually sourced by you, that you were on the ground and not rehashed from the TV or an obscure print article from last month. But we are fed up of the same style of delivery – surely there must be better ways to deliver these stories. We will pay for those bold enough to try something different rather than the 50 year old news model, mostly based on 70s and 80s US style delivery. 10 Relevance – We will pay for relevant ads – or just turn them off!? We think that there is a big opportunity missing in your puzzle. We will be happy for semi-personalized relevant advertising, even wrapped around paid content. We know it’s the the sort of thing that ends up (across the board) on a ‘content management system’ upgrade as low priority justified in the accountants office as “people are not into personalisation – it will never work”, so people never actually experience what that means. But we will eventually see a bold traditional company reach out and allow us to be as much interested in personally relevant news as in personally relevant adverts for stuff I am about to or may buy. Do not interrupt with irrelevance, tempt us with relevance – locative, temporal and aspirational. I could go on and on about user value systems in the evolving media landscape but truly hope that large news organisations can become fleet of foot and adapt a lot quicker than they are. Many are still in pre-social media days, upgrading their publishing systems at a snails pace while around them a much faster, people sharing neural ‘inter-web’ has grown – here news travels at the speed of ‘society’ for society not at the speed of those who commentate on it from afar. Or of course, lets rely on the real truth – statistics created by heritage media! Appendix – Film Distribution Parallels? Conferences around the world are filled with endless panels talking about how complex online distribution is, how you can’t make ‘real’ money or why putting anything online is suicide. Wannabe video content makers for example will sit and listen for hours to producers talking or blogging about release windows, rights nightmares, multi platform format problems, how expensive it was to make their “30 minute masterpiece” and why they shouldn’t allow anyone to see it who doesn’t pay. Further to this there have been way too many complex and rambling white papers on the topic that talk about problems rather than solutions or practical guidance. Endless pages about complex rights problems, how to renegotiate with IP owners on archive material, how governments get in the way. Not really guides, most just confuse and don’t end up with any particular obvious recommendations – just a few vague ‘if you don’t do anything soon then you possibly maybe miss some sort of boat’. I recall hearing the same language back in 2003 in European Broadcasting forums. Then comes those big decisions, use an aggregator? rev share online rights with a few traditional channels? or try to go it alone, direct? All of the above? But lost in all this noise is one simple question that almost never gets asked. Does anyone actually want your content? Many answer, of course, what a silly question “I know my audience” then spend months years trying to really reach them? A shotgun approach perhaps, via a scattered demographic on appointment to view channels, something more targeted, perhaps only delivering to those who will actually enjoy it? With DVD sales in steady decline and online audiences growing exponentially, independent content producers need to explore alternative, web-based distribution methods. That is the view of Gary Hayes, Director – Laboratory for Advanced Media Production at the Australian Film Television and Radio School (AFTRS). “One of the questions Australian filmmakers often say to me is that they’re not prepared to take the risk of placing their content freely on the web and hoping that they will build an audience and that is being advocated at the moment by many people,” he said. “But if you are a new filmmaker, your first priority is to be known, to actually show that you exist, because that is a real issue.” One potential model is to first give away low resolution versions of a production on the web to generate and grow an audience. Lets go back to basic principles. Screen Business in Australia is often more about tax incentives, hand-outs from Government and best techniques in how to get an award from one of the state or national agencies. Then there is the red herring of physical Festivals lead to big distribution deals. So most screen content producers focus is TV, Box Office and will happily spend 2-3 years after they have made a film getting bits and pieces deals – which slowly grinds away their creative passion and why they got into the business in the first place. You don’t need to create popularist films to reach an audience as Martin Walsh suggests but you do need to slowly build an audience for what you do. You also need to be passionate about what you do. In today’s Social Media landscape, charlatans and those just in it for the money (media gold diggers) are spotted by the community very quickly. Be social, become an influencer in the area you work in, join in a dialogue with that audience and later on effectively crowd-fund future projects. A loyal audience who will pay for the good, passionate stuff you do may most likely be 30 000 avid Motorbikers around the world who enjoy great ride films. I once worked for a company who made railway films and distributed themselves on VHS. A very big living. 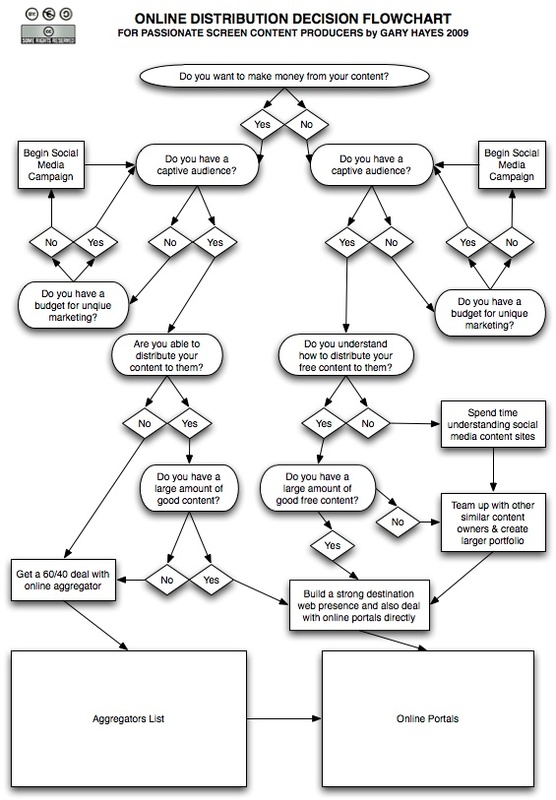 In terms of online deals this flowchart will give a simplified idea of how to achieve what you want. I had a conversation last week with a young guy that dropped out of a university film course. He said that rather than spend his money on course fees he was going to spend it on making movies. I asked if he had a YouTube account – no. Twitter? No. Any kind of web presence? No. Its saddening to me that while UGC grows, the pros hate to go up against “amatures”. It was Seth Godin that said the Internet has freed us from the tyranny of being picked. Yet unfortunately too many would-be professional creators hate that idea that the unwashed public should be able to vote with their attention and their cash: they still want a Simon Cowel to pluck them from obscurity and tell them their work is of value. Thanks Rob – I agree this sort of attitude is rife. Fear of public criticism often means a lack of confidence in your creations anyhow. I think we are in transition though and eventually all good story creators will join the ‘game’ – much like musicians now realise the need to create a fan base across the web AND live as 100 000 fans = much more than wishfully thinking some A&R person is going to ‘discover’ them…more importantly just like the old days of record companies, having a loyal fan base in tow made securing a lucrative deal much, much more likely. The $$ value of online news stories and how paywalls will work t.co/l20fqlON or will they? Eventually, social networks end up selling us, not the actual service. Since there is a significant amount of people using a specific social media network, there is a high probability that advertisers will get attracted to it. Thank you for an elaborate and detailed article. It covers almost all points. Paywalls was a novice concept for me. Thanks for bringing it to light.